Time To Vote! 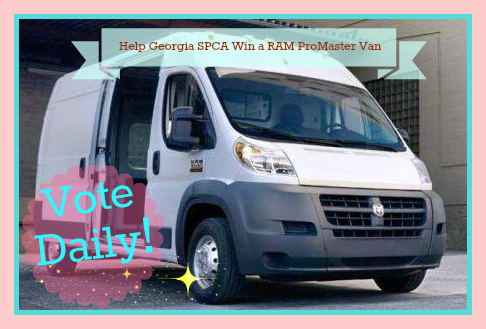 Help Georgia SPCA Win a RAM ProMaster Van! Georgia SPCA been selected as one of 25 semi-finalists in the Chrysler contest to win a brand new Chrysler Ram ProMaster commercial van! The RAM ProMaster Van will transport hundreds of dogs and cats to low cost spay and neuter clinics which will help reduce thousands of unwanted puppies and kittens from being euthanized. It will transport hundreds of animals from Georgia's high kill shelters to the safety of the Georgia SPCA adoption facility. We will proudly use our Ram ProMaster Van to transport hundreds of animals to adoption events to find a forever home for each and every animal. The Ram ProMaster Van will be a sign that The Georgia SPCA as arrived and thousands of animals will be saved. Just click this link: http://bit.ly/13lhXYN and click VOTE. That's all - no registration or facebook application is required. You can vote once daily per IP address (laptop, phone, etc.) Please share with everyone you know - we would REALLY love to win this van to transport our rescues. Thank You!